Rundfunk- Sinfonieorchester Berlin is eager to try alternative venues for their chamber music series. 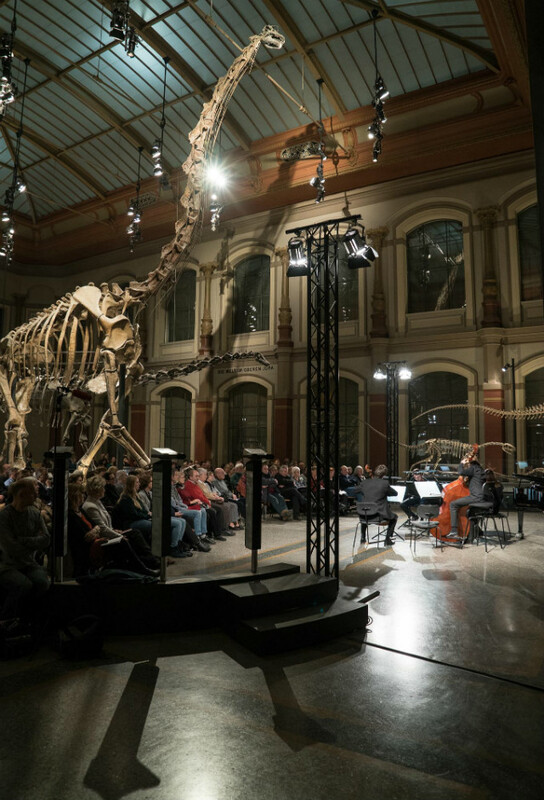 Thursday night’s concert took place in the main hall of Berlin’s Natural History Museum. 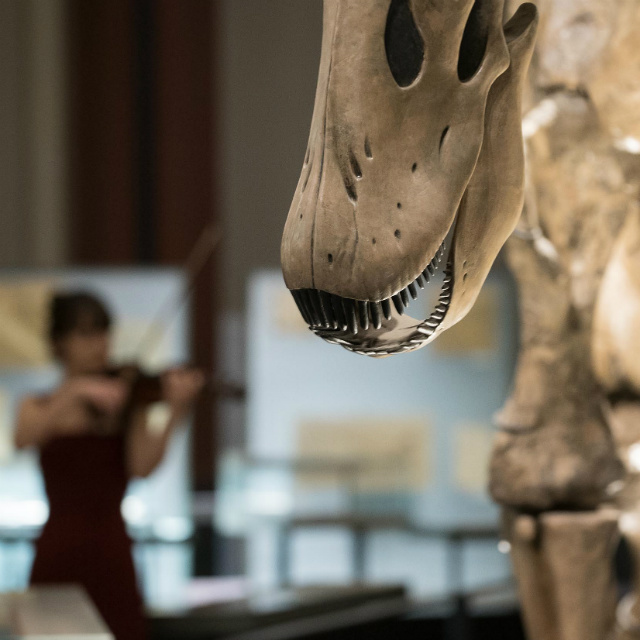 The imaginative programming of Baroque and 20th-century chamber works was quite literally overshadowed by the world’s biggest dinosaur skeleton: a 13.27 metre-high brachiosaurus. It makes for a refreshing change when classical music is performed in less conventional (and often less stuffy) settings. But the novelty of being surrounded by dinosaurs was not enough to offset the venue’s drawbacks. The steady hum of air conditioning meant that meaningful moments of silence could never really be silent. And the hall’s especially resonant acoustic meant that every murmur, fidget and shuffle from a single audience member could be heard by all. These slight annoyances could be ignored. But the hall’s high ceilings and its resulting echo-effect nevertheless posed a challenge for the performers. Sometimes, it was used to its advantage. It suited the solo Sequenzas by 20th-century Italian composer Luciano Berio. Berio wrote fourteen Sequenzas, each composed for a different instrument. They are exceedingly difficult to play. Yet they do not only serve a virtuosity of the flying finger or the agile tongue. The pieces also demand a ‘sensibility and intelligence’, requiring a deep understanding of the history of the instrument. On Thursday we heard three of Berio’s Sequenzas. Markus Schreiter opened the concert with Sequenza I for flute. Schreiter produced a smooth and even tone. Quiet moments were especially eerie, ringing through the large hall. Meanwhile, Steffan Tast was unafraid for the harsh rawness in Sequenza VIII for violin. Even in this large space, he forced all attention onto him as he alternated between fury and jitteriness. The piece’s virtuosic demands were under Tast’s control, with his fingers skipping across his violin during fantastically intricate fast sections. Oboist Gudrun Vogler was the most physical of the three soloists, which suited the slithering and writhing Sequenza VII for Oboe. She fearlessly explored the piece’s interesting and sometimes even ugly sounds, not being shy of its haunting squawks. Programmed between the three Sequenzas were three of Bach’s Brandenburg Concertos. The combination of Baroque and 20th-century might cumbersome, but their juxtaposition emphasised the continuities between them. As Schreiter finished his flute solo, he went straight into Bach’s Brandenburg Concerto No. 5, where he also undertook the role of soloist. The continuation felt entirely natural. The switch from a 20th-century to a Baroque sound world was shown to be not such a big step. The Brandenburg Concertos were less suitable for the hall’s resonant. Some of the crispness of Bach’s intricate compositions was lost. It was especially problematic in Brandenburg Concerto No. 6, where two violists, Gernot Adrion and Carolina Montes, took the leading soloist roles. Yet they were shy of taking the limelight, meaning there was a serious problem with balance. The soloists blended into the rest of the ensemble, meaning one had to strain to hear the melody. Nevertheless, it was pleasing to watch members of Rundfunk-Sinfonieorchester take genuine pleasure in playing together. Their ensemble playing was generally excellent, and they had a skilled ability to steadily build up to climaxes together, in complete synchronisation. Being surrounded by dinosaurs provided another dimension to the concert. It was only a shame that the performers did not always meet the challenges of this unique performance-space. Hazel is a an arts and culture writer based in Berlin. Classical music might be her speciality, but all things artsy, cultural and interesting also fit her palette. Follow her on Twitter with @hazel_rowland or read her blog here.